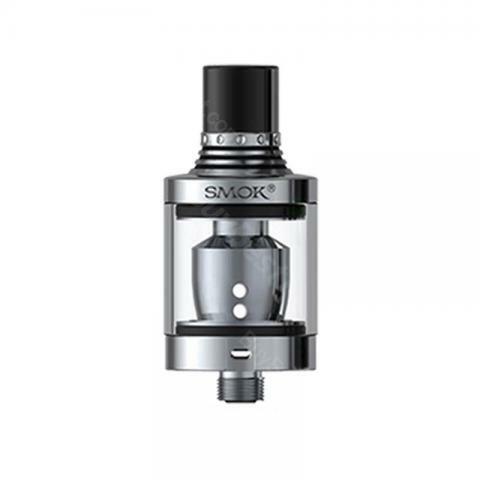 SMOK Spirals is a compact size subohm tank in 22mm diameter and 2ml juice capacity. It's a desirable cloud system, which specialized designed for flavor-enhanced output. It will bring your authentic, charming, powerful and extraordinary vaping experience. SMOK Spirals is a compact size subohm tank in 22mm diameter, maintains a petite stature while featuring a 2ml juice capacity. 22mm in diameter will be compatible with most batteries or MODs. It comes with a 0.6ohm dual core pre-installed, also includes a 0.3ohm dual core and a single-coil RBA coil head for optional. Spirals Tank is a flavor-focused structure caused by 4 adjustable bottom airslots which will provide ample airflow for vapor, aslo with an elongated drip tip. SMOK Spirals flavor atomizer is a highly desirable cloud system, which specialized designed for flavor-enhanced output. It will bring your authentic, charming, powerful and extraordinary vaping experience. • Hold the tank with one hand, and use another one to press top cap and move it clockwise. • Close the cap carefully and firmly. Then let it stands for several minutes to get the organic cotton completely saturated. • Taking RBA deck apart. • Installing and positioning the pre-wrapped coil. Place the coil between the posts and wrap the ends around the screws and tighten up, once all in place make sure the coil is fixed in the center and lined up with the air hole, and also make sure the coil is NOT touching the base. • Cutting the ends of wire off. • Cutting a strip of cotton and make sure it’s not too much and not too less. • Cutting the cotton at an angle and make sure it’s not too short and not too long. • Wet the coil with your e-liquid and adjust the cotton. • Quick Link: SMOK Spirals Coils ; SMOK Spirals RBA Coil. Excellent little tank, dont get me wrong it has its flaws, the main one being it can on occasion leak , but that depends on the coil, if you stick to a trusted source for authentic coils it really isnt that bad, and overall well worth the effort, ive tried a lot of tanks since i started vaping and always come back to this one, the flavour is outstanding. Another one of its flaws its its fiddly lid, some are worse than others, i find if you hold the top and screw the tank to it, instead of the other way around as would be normal, then it works fine. The flavor of SMOK Spirals Tank Atomizer is excellent and all it takes is adapted to the price and quality. Alles wie SMOK Spirals sein sollte. Ein Produkt, das Spaß macht. Klare Kaufempfehlung !